When the summer heat and humidity arrive in Oldsmar, Florida, you need to have a cooling system that can keep you comfortable all summer long. While a single central air conditioner works well for many homeowners, a simpler solution may work better for your home. From targeted cooling to quiet operation, discover six reasons to consider a ductless AC for your Florida home. While central air conditioners provide cool, clean air to every room of your home, ductless air conditioners work a little differently. Also known as mini-splits, single-zone ductless systems direct cool air to targeted areas. With a single-zone system, each outdoor unit pairs with one indoor unit, which cools a room or a designated area in your home. Although mini-splits can cool just about any room in your home, they work particularly well in certain areas. Parts of your home that aren’t connected to your HVAC system’s ductwork, such as sunrooms, finished garages, and new additions to your home, tend to be excellent candidates for ductless air conditioners. Need to cool an entire floor or even your whole home? Ductless air conditioners can do the job, and you might not even have to purchase multiple single-zone units to provide complete coverage. Instead, multi-zone ductless systems, otherwise known as multi-splits, offer smart solutions to more complex cooling needs. These systems require just one outdoor unit, which connects to as many as five indoor units. Since each indoor unit can go in a different room, you could cool a whole floor or a small home with just one multi-split. You won’t need even an inch of ductwork, which can help you save on installation costs. 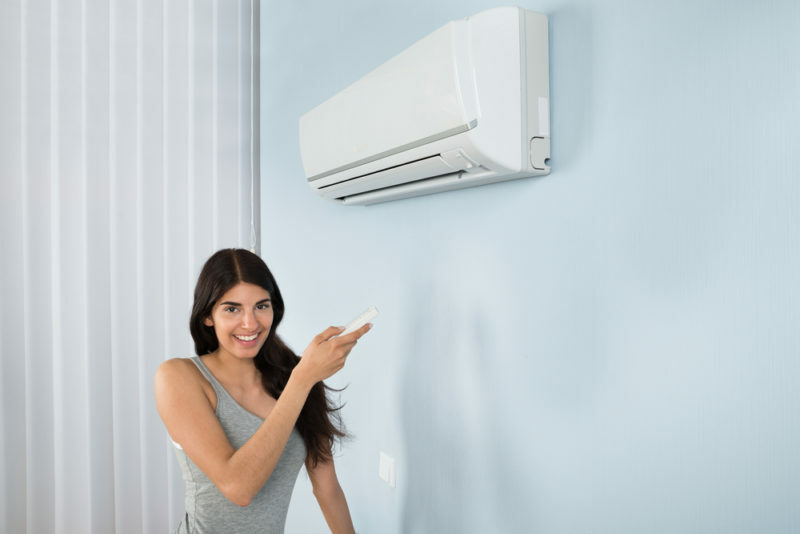 Whether you want to make your home a little greener or you’re concerned about utility costs, you’ll appreciate the impressive efficiency that ductless systems offer. Since they don’t require ductwork, mini-splits don’t have the substantial energy losses linked to leaky ducts and central air systems. As a busy homeowner, you’ll also appreciate that keeping a ductless system efficient doesn’t take much time or effort. To maintain your ductless system, you’ll simply need to clean the filter regularly and make sure the outdoor unit is free from branches, leaves, and other debris. If your schedule doesn’t allow for a time-consuming installation, you’ll also love how easy mini-splits are to install. In fact, the Advanced Cooling Systems team can often install a mini- or multi-split system in a single afternoon. Because these systems don’t require ductwork or extensive customization, they’re a breeze to install. Unit placement tends to be flexible, too. The outdoor units take up very little space in your home’s side yard or backyard, and our team can install indoor units on the ceiling or wall, depending on your preference and the style of the unit. Ductless air conditioners do more than keep you cool. They also clear the air, improve indoor air quality, and help you breathe easier. Mini-splits rely on washable filters to capture airborne dust, dirt, and debris and remove these contaminants from your home’s air supply. Many ductless systems also feature humidity controls, which help moderate moisture levels and keep you more comfortable. Together, these features can give your indoor air quality a substantial boost, especially when compared to the limited air quality capabilities of the standard window air conditioner. If you typically use window air conditioners to cool duct-free rooms of your home, you’re probably accustomed to the loud noises that most emit. When you invest in a mini-split system, however, you’ll appreciate the low noise levels and quiet operation. In fact, you might not even notice that the unit is on as it cools the room. Window air conditioners can also present safety and security concerns, due to their often precarious placements and need for open windows. In contrast, ductless systems offer much safer cooling options that won’t risk the security of your home or your family. Ready to find the ideal ductless air conditioner for your home? Call the experts at Advanced Cooling Systems today: 866-827-7662.